The Splash Kats were a popular attraction in the eighties. The boats seated two people, each with a set of pedals, and a steering mechanism in the centre. As you pedalled, so the boat went forward or backward. 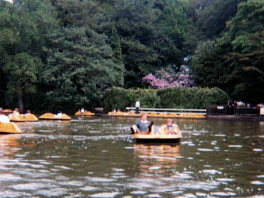 The Kats were originally found on the small lake, where the Swan Boats would subsequently be situated. When the Swans were installed, the Splash Kats were re-located to the lake, in a small roped off section, to keep them away from the rowing boats. The Splash Kats' fortunes went the same way as the rowing boats, and were removed in 1996.